2. 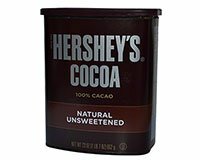 Melt butter and combine with Hershey's Cocoa. 3. Remove from heat. Stir in sugar and eggs. Mix well. 4. Add flour, salt, pecans and vanilla. Mix well. 5. Pour into greased 13 x 9 x 2 inch pan. 6. Bake for 35 to 45 minutes. 7. Remove from pan, then sprinkle marshmallows on top of hot cake. 8. Cover with chocolate frosting.